These tire chains work GREAT! Once completed, I just had to take it out for a test ride. I did not feel any slippage or loose control at any time. 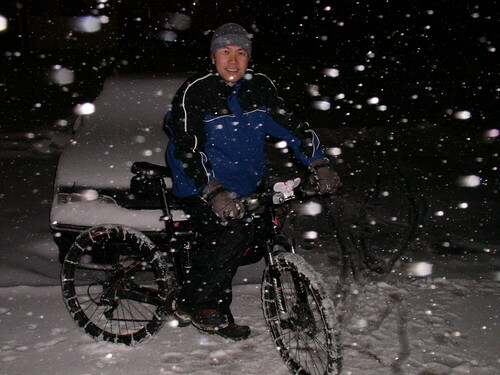 Iâ€™m amazed to see how much traction I had by simply adding chains to the tires. If you look closely, I did not run a cable to hold the chain on the back tire. They are only secured by zip ties. I did this to see if the cable is really necessary. Seems to be working for now. I guess Iâ€™ll find out sooner or later. How important is air pressure in your tires? That’s great! Unfortunately, I won’t be able to copy your design (rim brakes) but you’ve got me thinking about alternatives. 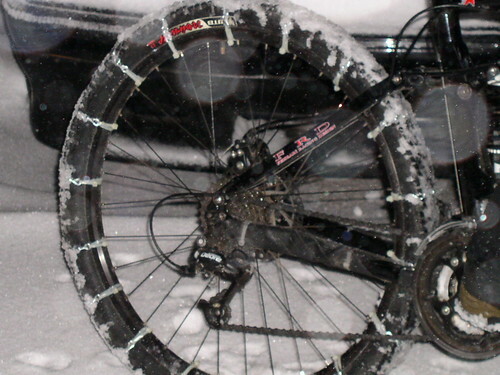 What do you think of a set of makeshift studded tires? Drive some (very) short sheet metal screws through the knobs on the tread. I think with a puncture resistant liner and a thick inner tube, it might do the trick.